"This is a wonderful CD, so anointed, so inspired, so passionate and heartfelt." "This inspiring cd is the appetizer that has whet my appetite... It has driven my hunger to greater depths." "I listen to the CD nearly daily... The Secret Place now tops my list." "I have used this album for many years to come into the Presence of the most High God. It is awesome and the best album I own." "Makes me want to touch the heart of God - to be real, release emotions that are otherwise held back." This album is the instrumental version of Seek My Face. The music features piano and acoustic guitar for instrumental soaking, christian meditation and prayer. 10 of the 11 original Seek My Face tracks are available as an intrumental version. Some of the tracks have soft vocal hints in places, but the majority is instrumental soaking worship. There’s nothing more inviting than a room filled with the sound of beautiful worship - especially when that music also invites the Presence of the Holy Spirit Himself! The mood and atmosphere in a room is changed completely by the presence of God’s Spirit. Your home can be an oasis of peace – a secret haven of rest far from the maddening crowd and the pressures of the outside world. We want this gentle, soothing music to bring peace to your home, and fill your heart with worship. "Draw aside and allow these intimate songs to carry you into the secret place of His presence." 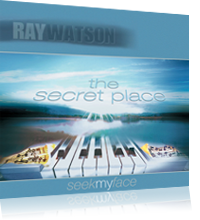 The songs of The Secret Place are not Christian entertainment. They are songs of the heart and simple intimate expressions of spontaneous worship - passionate pleadings of a soul in pursuit of God. This album is not just a listening experience, it is a journey of worship with the songs becoming more intimate and spontaneous in nature. We encourage you to draw aside, and allow these prayerful, intimate songs to carry you into the secret place of His presence. An intimate worship song with a lovely celtic lilt. An intimate and touching song on piano. Intimate worship with nice acoustic guitar work throughout. A morning prayer - to be with the Lord, and to walk with Him throughout the day. A spontaneous song. This little gem came at the tail end of a 20 minute "free worship" time that I had one morning. The original piano audio file is an unrehearsed and live recording. The instrumental arrangements were added later to give a little more substance to the song. Hope you like it. Don't forget to "be" with Him today! A spontaneous song of worship based on Psalm 91. Instrumentation was added later. A simple worship song recorded live. Instrumentation was added later. Some radical free praise! A plaintive prayer, longing to be closer to the Father's heart, to be one with Him. A gentle but passionate worship song. Recorded live, instrumentation added later. Some lovely acoustic guitar. A passionate prayer for coming into the Secret Place of His presence. A "free worship" piano improvisation. Expressive, creative, unique. Worship from the heart. This little gem came at the end of a worship time I had one morning. Totally improvised. "It is very anointed...you have managed to capture something unique...so far ahead of its time. Message: Your music has been a blessing to me and has taken me to new heights in the Lord through the worship and praise. I love to listen to it while I'm working on a message for church. Message: Thank you for teaching how to soak in His presence! Message: "I love to listen to Gospel Songs all day long. May the good Lord bless those who make it possible to bless souls through songs. Paul Kemga - Papua New Guinea. Message: I lov to hear ur gospel songs. My the glory of God be o u, Amen. Message: I like songs im very happy be blessed. when I forgive I fill love of Father thouhr Jesus Christ, I start tobe more wisely, my faith grow up little more, the impotent become more clealy love to porson who was forgiven. Message: GOD BLEES YOU ALL. Message: This music is blessed music. So refreshing. This brings a peace and a quietness to one's soul. Thanks so much for bringing such wonderful and peaceful music. May God contiunue to bless you. Message: This is anointed music from the Throne Room of God. The moment my wife and I heard it we knew the Holy Spirit had connected us. This is intimate worship we can relate to, that we longed for. It brings us into the presence of God.Glory to God!